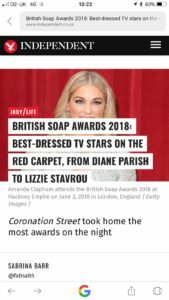 Our Theatre School teacher Lizzie Stavrou this weekend went down to the soap awards where Hollyoaks did great winning 5 awards. She had a brilliant time on the Red Carpet and got listed as one of the best dressed of the night. Well done Lizzie!! !